Richmond, mun. bor., market town, and par., North-Riding Yorkshire, on left bank of river Swale, 42 miles NW. of York and 237 from London by rail, 2520 ac., pop. 4502; P.O., T.O., 2 Banks, 1 newspaper. Market-day, Saturday. The town grew up under the walls of the castle (1071), a fortress of vast strength, now a majestic ruin, occupying the summit of a cliff overlooking the river; it was the prison of William the Lion, King of Scotland, after his defeat at Alnwick. Richmond has remains of 3 monastic institutions, a free grammar school of high reputation, an extensive corn market, iron and brass foundries, a papermill, &c., and gives the title of duke to the family of Lennox. It returned 2 members to Parliament until 1867, and 1 member from 1867 until 1885. A Vision of Britain through Time includes a large library of local statistics for administrative units. For the best overall sense of how the area containing Richmond has changed, please see our redistricted information for the modern district of Richmondshire. More detailed statistical data are available under Units and statistics, which includes both administrative units covering Richmond and units named after it. 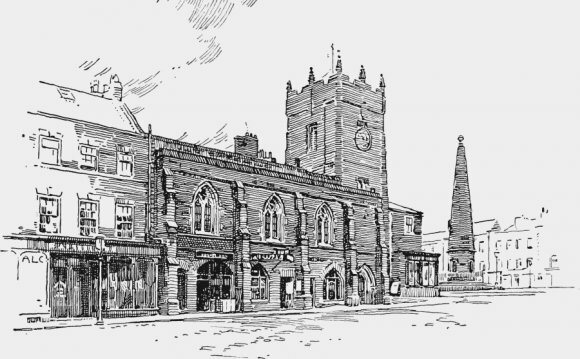 GB Historical GIS / University of Portsmouth, History of Richmond, in Richmondshire and North Riding | Map and description, A Vision of Britain through Time.